Your company is growing and there is an urgent need to reduce time-to-hire. A decision has been made to engage an external talent acquisition firm and your team is tasked with creating the RFP. Vendor responses are needed quickly and the pressure is on to meet with key project stakeholders to define project requirements, scope, and goals, and write a clear, concise RFP. The construction industry’s skilled labor shortage is costing it huge amounts of money. Just how much money, exactly? In the case of equipment repair technicians alone, a 2015 study conducted by The College of William & Mary on behalf of the Associated Equipment Distributors (AED) estimated that the technician shortage was costing the heavy-duty equipment distribution industry more than $2.4 billion per year in lost revenue. Patriot Capital Group is pleased to announce a new subordinated debt and equity investment in Orion ICS, LLC and its wholly owned subsidiary Novotus, LLC. Patriot's investment supported L2 Capital Partners, L.P. and Lakewood Capital, LLC acquisition of Orion. Today’s tough labor market is putting recruiters to the test. While some of them are certainly rising to the occasion, a far greater number aren’t faring as well. Case in point: there are currently 7.1 million job openings, according to latest report from the U.S. Bureau of Labor Statistics. Assigning blame is tricky, with multiple factors contributing to this issue, including unprecedented pressure and lack of experience among recruiters. One of the many benefits of a strong job market is that veterans returning to civilian life are finding opportunities more plentiful than in years past. Not everyone is faring equally well - some former military enlisted personnel who lack college degrees are struggling. So are some with military-connected physical or emotional disabilities. With Veterans Day coming on November 11, it’s an occasion to again raise a very good question — “Why aren’t we doing more to hire the veterans who have served our country so well?” Orion Talent digs into that question in its 2018 Veteran Hiring Survey, and the research and analysis offers a new look at both the advantages and challenges of hiring veteran talent. October 10, 2018 - Orion Talent, a proven total talent solutions provider, is excited to announce its St. Louis, Missouri, Hiring Conference on November 4 & 5, 2018, the first such event Orion has held in the city. Hire veterans because of what they bring to the table rather than compliance requirements or because “it’s the right thing to do,” says a new study. A majority of companies (79%) find that veterans offer businesses the qualified, committed and high-performing employees they need, according to Orion Talent’s new Veteran Hiring Survey: Exploring the Bottom-line Value of Hiring Veteran Talent. The battle for talent is on in the oil and gas industry. Major companies are rushing to invest in strong growth regions like the Permian Basin and Bakken Shale Play, which are already have full employment. Labor shortages and tensions around tariffs and trade are frustrating hiring teams. When coveted talent is identified, hiring managers are still hitting pause before finalizing candidate offers. Insanity is doing the same thing over and over again and expecting different results. Remind you of your budgeting process? Most Talent Acquisition (TA) teams have long suffered the consequences of working with unrealistic budgets, yet it’s still a tough pattern to break. Siemens Corporation, a U.S. subsidiary of global technology giant Siemens AG, and Orion Talent, a total talent solutions provider, take on the growing challenge of where manufacturers should turn for experienced, highly skilled technical talent at the IndustryWeek Manufacturing & Technology Conference & Expo in Raleigh, North Carolina, on May 9. The increasing complexity of recruiting and the importance of top talent to organizations’ strategic growth continue to create ripe conditions for those organizations to outsource their recruiting functions to external providers. The competition for top talent has never been greater. Low unemployment, the need for highly skilled labor, a shortage of qualified candidates, and the openness towards relocation have all contributed to the increased difficulty to attract and retain top talent. First, a special THANK YOU to ACCA’s partners at Orion Talent for speaking at ACCA’s Annual Conference. ACCA hosted David Coe, Senior Vice President of Strategic Programs at Orion Talent, at the Annual Conference in Washington, D.C. David led the “Hire a Hero, Hire a Veterans: Transform Your Business with Top Military Talent” Learning Lab at the conference. 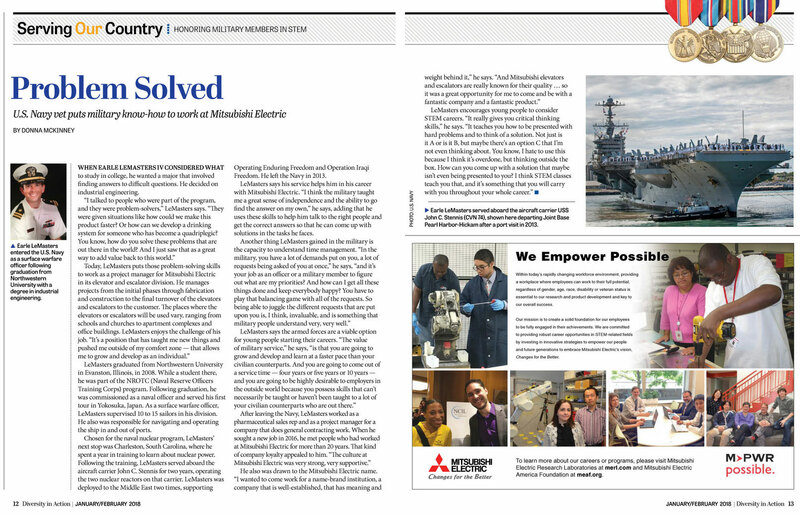 U.S. Navy veteran Antwan Richardson works for Eversource Energy, which serves Connecticut, New Hampshire, and Massachusetts, as supervisor in substation operations. When Earle LeMasters IV considered what to study in college, he wanted a major that involved finding answers to difficult questions. With jobs in HVAC projected to grow by 15% within the next 3-5 years, business owners and leaders may be wondering where to find the best skilled talent to add to their growing teams.